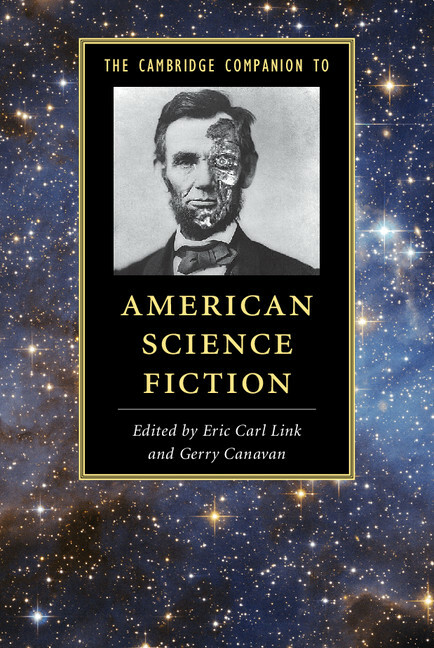 Gerry Canavan, the co-editor of The Cambridge Companion to American Science Fiction, traces our fascination with outer space from Star Trek to Guardians of the Galaxy and charts the evolution of our bleak pop cultural view of living beyond Earth. In Donald A. Wollheim’s 1971 survey of the state of science fiction, The Universe Makers, he identifies what has been called the “consensus future” of science fiction: the entry of human beings into the “New Frontier” of the solar system and the larger galaxy as extraplanetary colonists, towards the construction of a Galactic Empire. From familiar midcentury fictions like Heinlein and Asimov’s future histories to Gene Roddenberry’s ubiquitous Star Trek, it’s hard to think of any subgenre of science fiction more obviously influenced by American cultural history than this kind of space opera. As John Rieder demonstrates in his “American Frontiers” essay for The Cambridge Companion to American Science Fiction, the dream of the open frontier has functioned in America as “the catalyst of America’s capacity for continual renewal and reinvention of itself” (168), a dream which was transmogrified in midcentury American science fiction into the horizon for a wide-open and optimistic future just around the corner. Outer space was, as Captain Kirk said, the Final Frontier, “‘final’ not because it is the last frontier, but because it promises an inexhaustible supply of them” (169). We’d never run out of road again. It’s a dream that the U.S. government once devoted billions of dollars towards making real. But the “consensus future” began to turn sour at almost the very moment Wollheim was writing. In the early 1970s, we became acutely aware that, as the poet said, Mars ain’t the kind of place to raise your kids: too difficult to reach, too inhospitable to live in, and too bereft of valuable resources to make it worth the effort, the prospect of an Outer Space Gold Rush fizzled in the face of its highly impractical logistics and the stubborn refusal of physics to cook up the sort of antigrav platforms and hyperdrive engines that would make a space empire actually work. Meanwhile things at home were getting worse. The more pessimistic science fiction of the 1950s and 1960s, the ones that didn’t see us heading out into outer space, feared our end would come at the hands of the nuclear bomb—but the environmental movement suggested instead that technological progress had actually set the bomb off a hundred years ago and we were only just now starting to notice. 1972 is not only the year of the last mission to the moon, but the year of the publication of The Limits to Growth and The Sheep Look Up; 1973 brings the Endangered Species Act, Soylent Green, and the shock of the first OPEC oil embargo. In the face of a long parade of economic, ecological, and military disasters, American futurological speculation grows more and more dire over the course of the 1970s and after, both within science fiction media and outside it; rather than a wide-open future among the stars, we became much more convinced that our future is Earthbound and ecologically miserable: choking smog, acid rain, empty petrol stations, melted-down nuclear power plants, overpopulation, poisoned oceans, climate change, mass extinction. This is why it fascinates me that after decades of robot uprisings, environmental catastrophes, and zombie nightmares space opera is suddenly all the rage again in big-budget Hollywood films. The unexpectedly stratospheric success of Guardians of the Galaxy in 2014 has made the trend unmistakable, but the recent relaunch of Star Trek, the surprise announcement of Star Wars: Episode 7, the popularity of the Mass Effect series of games, and both Interstellar and Jupiter Ascending (among many other examples) all show that we’re suddenly eager to think and fantasize about outer space again. Perhaps we might even go back as far as Joss Whedon’s Firefly (2002) as the start of this recent trend in science fiction film and television (though Firefly sadly never had this sort of mass, blockbuster appeal of the more recent films and games). Blockbusters like Guardians of the Galaxy and Jupiter Ascending show interstellar civilizations that are both frighteningly undemocratic and torn apart by violent strife, populated by bewildering monsters. Both Guardians of the Galaxy and Jupiter Ascending show interstellar civilizations that are both frighteningly undemocratic and torn apart by violent strife, populated by bewildering monsters. In these stories the space empire doesn’t even involve the human species as an agent at all, not even as a bit player—it’s a final frontier, but not for us. Star-Lord might bring some Motown with him as his soundtrack, but otherwise there’s no future for the human race out there; even if we could get to where he is, we’d just be eaten alive by the horrid space bogeymen that populate the larger galaxy. Mass Effect, too, suggests a sort of cosmic hopelessness replacing the optimism of the old space opera; the wider universe is a place of horrific genocides and miserable forced choices, not hope for better worlds. No wonder Jupiter Jones of Jupiter Ascending decides she prefers scrubbing toilets down here to be being rich beyond imagining out there. At the end of Battlestar Galactica they deliberately crash their space fleet into the sun to join the cavemen of prehistoric Earth for a reason; after all their wretched adventures they’ve had quite enough of space, thanks. And there’s nothing out there for us in Pixar’s WALL-E, either, except some empty calories; instead our only real hope is to come back down to Earth, clean up our mess, and plant some trees. Of all my examples Interstellar most closely parallels the long reach of cosmic pessimism in the last forty years of science fictional history. In the film a planet Earth beset by cascading ecological catastrophes finally turns back to the oldest science fictional dream, the stars, as its way out of what would otherwise be a hopeless crisis. The handful of outer space planets we’ve found out there are all incredibly lousy, but they’re the only options we have left. Through the miracle of contact with the fifth dimension—don’t ask—the necessary equations are able to be solved and some fraction of the human race is able to be saved, though we never see too many of the details, and perhaps it’s best not to think too hard about exactly how many people managed to get off Earth before the place became totally uninhabitable. The last shot of the film is an American flag standing silent watch not over some bustling space metropolis but a tiny encampment in a barren wasteland: our new and only home, for better and for worse. The robots of Asimov’s future history, charged with protecting mankind at any cost, once concluded that the Earth is just too good a place to raise your kids: it’s so beautiful and lush, so utterly perfect for us, there’s no reason we would ever leave. So they decide to poison the Earth’s crust with radiation to force our hands and force us off the planet, where we can scatter to every corner of the galaxy and be safe from the threat from any local mass extinction event. (The robots, take note, were the good guys in that story.) But stories like Interstellar give us an even more depressing take on our once-heroic migration into space: in the new version of the story we poisoned the Earth ourselves, and so now our only hope is to slink away into the night, less like hardy pioneers and more like desperate refugees, hoping our second roll of the dice might somehow go better than the first.